Stone Mills Township councillors expressed concern that the Tamworth branch of the Canadian Imperial Bank of Commerce is to close in July. Photo by Adam Bramburger. About 30 km north of Napanee near the southern edge of Beaver Lake, Tamworth has become a one-stop shopping and services hub for thousands of rural residents and cottagers. At a fork in County Rd. 4 by a single yellow blinking light, one can park a vehicle and easily walk to a hardware store, a drug store, an LCBO, a bakery, a mechanic, real estate offices and a bank. For those wishing to stay for some entertainment, an arena and a Legion are also steps away. Last week, the community was jolted by news of an impending blow to that range of services. 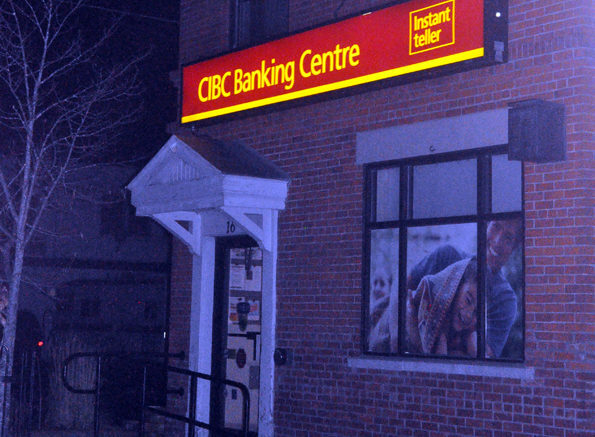 On large poster boards inside the first building on the northeast side of the street, the Canadian Imperial Bank of Commerce (CIBC) advertised it will close its banking branch and remove its automatic teller machine by July 11, 2019. A similar notice was also sent directly to the branch’s customers. Contacted by the Beaver about the notices, Jon Kastikainen, the CIBC’s senior manager of stakeholder communications, offered a statement that cited a change in banking practices as the reason behind the decision to add Tamworth to a growing list of communities where the CIBC has closed branches. The Deseronto branch closed its doors in August 2016 and last year, one in Bloomfield saw a similar fate. “Currently over 80 per cent of our client transactions take place outside of a banking centre, through online, mobile and telephone banking. As a result of this shift, we’ve made adjustments to our network that includes a small number of rural and urban banking centre closures,” Kastikainen e-mailed. He explained the Tamworth branch would be consolidated with CIBC’s Napanee branch, which is located in the Napanee Mall. While Kastikainen’s statement indicated most clients in Tamworth use digital options, he added CIBC staff will spend time with clients to alert them to options for their everyday banking and help with a transition. To that end, there will be an community information meeting at the Stone Mills Township office at 4504 County Rd. 4 in Centreville to allow clients and community members to share their views and concerns. Community members can also share their concerns with the Financial Consumer Agency of Canada at 1-866-461-3222 or www.fcac.acfc.gc.ca. Jennifer Jefferson moved opened a consignment store in the village a year-and-a-half ago and recently moved to Tamworth. The bank was a factor in her decision. In the busy season, she visits three or four times a week for change and small bills that she can’t get at an automatic machine. The news was a real blow. Jefferson said the loss will be a big one for her community. She has one customer with mobility issues who doesn’t drive that has said she plans sell her house and move. She believes it will also affect tourism. Jefferson is a long-time CIBC customer who has her mortgage, business account, personal account, and investments with the bank. She said she’s disappointed there wasn’t more consultation with customers to find out what their needs are. Mark Oliver is the chair of the Tamworth-Erinsville Community Development Committee (TECDC). He said most people he has talked were “caught off guard” by the news of the impending closure. Personally, he says its disappointing that it doesn’t seem any of the big banks — not just the CIBC — appear willing to create a different kind of model that will work in small communities. Oliver points to Statistics Canada data that 30 per cent of the national gross domestic product comes from rural communities, yet there doesn’t seem to be a strategy to serve wealth producers close to home. From a community development standpoint, Oliver also hears concern about dollars leaving the community. He said it’s hard for active businesses within the community to not have a convenient site to do cash transactions and, for all residents, even though the CIBC might sight overall banking trends, there’s still a need for personal contact, particularly in a rural area with a senior population and a spotty communications network. Oliver said he expects the TECDC will pay an active role in rallying community members to voice their concerns with CIBC, propose alternative service models, and support the Stone Mills Township in efforts to find a service provider. At the same time, the TECDC will be working to bring positive developments to the village. It regularly works on projects like enhancing garden spaces and promoting a concert series that has been an economic driver. There is also ongoing discussion about creating an electric vehicle charging station as another attraction. Regardless of any community efforts to save the branch, Oliver says the existence of a bank or even of retail doesn’t need to be the only gauge of the vibrancy of any smaller community.